Jerome and Summey was founded in 1934 by P. Jerry Jerome. As a businessman, Mr. Jerome saw the need for a local insurance agency to provide coverage for the many homes being built in Brevard, NC. 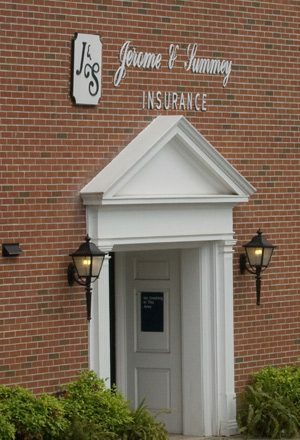 Meet the team at Jerome and Summey Insurance Agency. Our local insurance agents and support staff always put customer service first. Trust us to take care of you and your family. President: Phillip has 35 years of experience in the insurance industry, joining the family business of Jerome and Summey in 1982. Phillip earned his bachelor’s degree from Appalachian State University, is a graduate of Southeastern Insurance Institute, and maintains his designation as a Certified Insurance Counselor to provide an added level of service to his clients. With a passion to serve his community, Phillip has served on the boards of Transylvania Regional Hospital and the Transylvania County Arts Council and continues to volunteer his time as a trustee of Brevard College and of the Brevard Music Center. He also served as a past president of the Brevard/Transylvania Chamber of Commerce and is a Rotarian. He is an active member of Brevard-Davidson River Presbyterian Church and an avid cyclist. Accounting: Patti is a licensed agent and has been with Jerome and Summey since 1985, assisting in all facets of the agency, including operations. While not in the office or assisting clients, Patti serves the community on the Transylvania Endowment Board and previously served on the Board of Directors for the Turchin Center for the Arts at Appalachian State University. She is an active member of Brevard-Davidson River Presbyterian Church and enjoys hiking, tennis, and spending time with family and her many animals. Personal Lines Account Manager: Sharon has been a licensed agent for more than 10 years. She joined Jerome and Summey in 2005 as a receptionist and became a licensed agent in 2007, also obtaining her designation as a Certified Insurance Service Representative to offer her clients an added level of service. Sharon’s commitment to her clients shows when she reviews their policies and coverage and discusses the best options to suit their insurance needs. Administrative Assistant: Julie started her career with Jerome and Summey in November 2016, following a career in the banking industry. She strives to help clients feel appreciated and glad that they’ve chosen Jerome and Summey as their insurance agency. When not greeting clients in the front office or assisting them by phone, Julie enjoys spending time with her family and hiking in the inviting mountains of western North Carolina. Personal Lines Account Manager: Virginia joined Jerome and Summey in May 2018 as a licensed agent and is currently working towards obtaining her designation as a Certified Insurance Service Representative. She brings a diversified background including 16 years as a legal assistant and 2 years as the co-owner of a computer repair shop. She strives to provide professional services with a smile and “can do” attitude. When not assisting clients with their insurance needs, she enjoys spending time with her children and grandchildren, exploring new places, computer games, reading, and crafts.